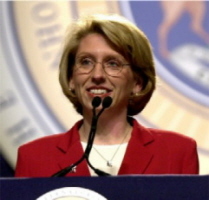 Today, at Noon, Julie L. Myers a/k/a “The ICE Princess”–the incompetent chieftess of Immigration and Customs Enforcement (ICE)–is speaking to the prestigious Detroit Economic Club. Oh, and she’s speaking in an interesting location, Dearbornistan. Normally, the DEC meets in a large venue in Downtown Detroit. But since Myers has shown a predilection for hanging with “former” Islamic terrorists and assorted terrorism supporters in Dearbornistan–the occasion of her last visit was to fete PFLP terrorist and immigration law breaker Imad Hamad and Hezbollah lawyer Nabih Ayad who sues to stop ICE deportations–the location is appropriate. In an extremely symbolic development, Myers will be introduced, today, by Michigan Secretary of State Terry Lynn Land, illegal aliens’ best friend in America. Though Myers’ agency is charged with stopping illegal aliens from obtaining fake IDs, aliens from all over America traveled to Michigan, where Land insisted on giving illegal aliens valid Michigan Driver’s Licenses. For the last five years, despite protests, Land–a Republican who wants to run for Governor–insisted that those who are here illegally have the same right to a Michigan Driver’s License as you and me. She was finally forced to stop issuing the driver’s licenses to illegal aliens under an opinion issued by the Attorney General’s office. Yup, this is the person that the woman who is supposed to be enforcing our nation’s immigration laws is using to introduce her–the woman who made it much easier for illegal aliens to live free and unfettered in our midst. The problem is she’s doing none of that. There’s very little to none of the “leveling of the playing field.” And there isn’t a desire to, as her Michigan/Ohio ICE Special Agent in Charge Brian Moskowitz a/k/a “Abu Moskowitz” has done very few raids on employers of illegal aliens. And those that he’s done have resulted in the release of many illegal aliens back into the great abyss. A raid in the last two years, for instance, found hundreds of Muslim Fillipino illegal aliens working as contract employees for some of Detroit’s largest corporations, including General Motors. Have you seen any indictments of GM or any deportations en masse of these people? No, because many of them were set free, back into the great American abyss. And nothing was done after the raids. It was a waste of time. And as for many of the other Muslim illegal aliens working in town, especially at Middle Eastern restaurants and other business throughout Dearbornistan, they’re off limits. The only restaurants Moskowitz will raid are Asian restaurants in remote parts of the State of Michigan. That’s because he’s hanging with these agents of Islamic terrorism in the pic, below. So much for “leveling the playing field,” when the man in charge of Immigration enforcement in Michigan and Ohio–the gateways into America for Islamic terrorists and other malefactors–has his enforcement policies co-opted by the company he keeps. Don’t expect The ICE Princess to speak to this in her phony utterances at today’s Detroit Economic Club speech. 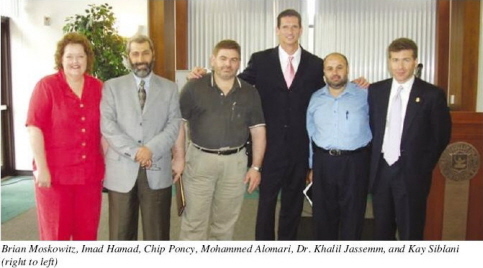 In the photo with Moskowitz (far right) are from left, M. Kay Siblani (the former head of CAIR-Michigan, who husband Osama Siblani was identified in Arab newspapers as a Hezbollah agent), Khalil Jassemm (head of terrorist charity LIFE for Relief and Development, which funds HAMAS and Al-Qaeda, and which worked with Saddam Hussein to send Congressman to Iraq), Mohammed Alomari (Executive of LIFE For Relief and Development and partner of Muthanna Al-Hanooti, who was recently indicted for spying for Saddam Hussein), Chip Poncy (a U.S. Treasury Dept. lackey), and “former” Islamic terrorist/FBI award revokee/marriage fraud perpetrator Imad Hamad. 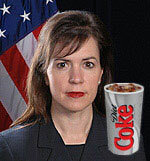 Wonder why the entire U.S. Attorney’s Office in Detroit had to recuse itself from the prosecution of LIFE official Muthanna Al-Hanooti for spying for Saddam Hussein and running an oil-for-food scam? It’s because people like Moskowitz hang with LIFE’s top officials and look the other way as they funnel money to Islamic terrorists targeting our troops and as they fight his own agents and prevent them from doing their jobs in enforcing immigration laws. Unwelcome to Detroit, ICE Princess. Now, go home. Until you have officials in the Detroit area who actually care more about enforcing immigration and customs laws than they do about buttering their pita bread, your speech is a joke. And your appearance in Dearbornistan, a comedy of errors. The guy, third from the right, looks like his head may have been shrunken. For the life of me, I do not understand why these people are not prosecuted, much less why they still have a job. Do they think that because they are elected and/or appointed bureaucrats that they are permitted to flout or disregard written law at their whim? I am utterly speechless. Are they getting oral or written directives from senior govt. officials? I’d like to know. Democrat or Republican – it seems to make absolutely no difference. Thank you, Debbie, for your expose here and elseswhere (e.g. illegal Muslim aliens getting CDLs) today, and for all your previous coverage demonstrating how our incompetent and corrupt government is aiding and abetting those who wish to destroy us. I would rather know the truth than not, but it is my perceived impotence to do anything about all of this (other than to alert friends and family, most of whom will slough it all off because it’s too dreadful to contemplate). Keep it up, nonetheless. This information needs to be disseminated as widely as possible. You guys just don’t get it. DHS and ICE were created to apprehend Mexicans not Muslims. Though not well reported by the mainstream press, all of the 911 hijackers were from Mexico. Most had worked at Swift and Pilgrims Pride meat processing plants prior to obtaining their pilot’s license. Mexico has declared jihad against the United States. ICE is on the job and on the Mexican! Kudos to Julie Myers and her $100,000+ meat plant patrol agents. Nothing is more dangerous to our national security than Mexicans beating our meat and pulling our pork. American will not be free until we all become Islamic vegans. Julie, you’re do’in a heck of a job!